Occasionally, our messaging might sound like we are down on Amazon. There is nothing further from the truth. Amazon is a juggernaut in getting goods in the hands of consumers. 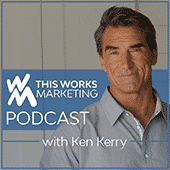 We at Script to Screen frequently make purchases from it, as well as use it to sell things like Ken’s book, This Works Marketing. Our message is to not be reliant on Amazon – to not keep all your eggs in one basket – but then also to utilize your marketing potential on Amazon to its fullest. There are many features of Amazon for promotion that a lot of companies aren’t using – are you one of them?